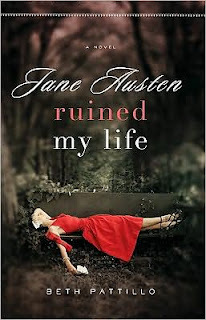 I first saw a review for Jane Austen Ruined My Life on 5 Minutes for Books where my friend and fellow staff writer, Lisa, reviewed it. Her review piqued my interest but then I forgot about it. Several months passed and everyone and their bloggy neighbor started reading and talking about it and I have to admit that I was feeling a little left out. So when the opportunity came along to read a copy - well, I just jumped on it, that's what! Because I am reading this first on the recommendation of Lisa, I'm linking this up to the I Read it Carnival at 5 Minutes for Books. I won't spoil the book for you in this review so feel free to keep reading. I say that because it actually would be easy to spoil this book as it has something of a mystery surrounding the life of Jane Austen which the readers must "solve" through the main protagonist of the book, Emma Douglas. Emma has just recently been separated from her husband who was carrying on an affair behind her back. Now, let's stop right there. I actually didn't think I was going to enjoy this book very much when I first started it because of how descriptive Pattillo thought she needed to be in allowing her readers to visualize the affair. Quite frankly, I didn't need to go there. A spouse cheating on a spouse is painful enough to have knowledge of. A picture painted out (and then repeated throughout the story as point of reference) is really quite unnecessary and I think that the subject matter could have been handled a little bit more discretely and it wouldn't have hurt the story at all. On the contrary, I think it would have helped me to enjoy the story more completely. However, the existence of this issue causes me to have to throw that little disclaimer in this review. It IS a "minor" point of the story but it will likely alarm the more conservative reader as you consider heading into this adventure. That said, everything about the book which did not involve the mention of the affair was quite enjoyable. Emma flies to London to escape her life which is falling apart all around her. She was a well-respected expert on the matter of Jane Austen until a rather unfortunate fall from grace in the professional world (which ties into the business of the affair.) She goes to London convinced that Jane Austen's high ideals of marrying for love, and ever-ready happy endings, has ruined her outlook on life. Hence the title of the book. In England Emma spends her time immersed in Austen's world and through some mysterious circumstances, comes to the conclusion that Jane Austen didn't ruin her life - she herself did. Despite my initial misgivings, this was a book that had me looking for every spare, quiet moment I could find so that I could devour it as quickly as possible. I can see now why Lisa and the rest were so very enthusiastic about it. It is just an all-around pleasurable read. I think it would make an awesome chick flick as it has all the elements of drawing crowds of women in. "You have to admit, it all sounds a bit far-fetched." "Most true things do," she replied. Thanks for the disclaimer. I had heard of this in several places and my interest was piqued, but I hadn't searched it out yet. I do hate when authors are more descriptive than need be about those types of things. I want to read this one! I really liked Pattillo's Mr. Darcy Broke my Heart. I enjoyed this book. It fit the bill for a simply fun, enjoyable read. Sometimes that's exactly what I need. Sounds like a fun, light read, your disclaimer notwithstanding, of course. I've tried to read another Jane Austen-ish book, and I just couldn't get into it. Maybe I'll give this one a try! I just made a patron request at my library for this book (and the follow up - Mr. Darcy Broke My Heart). After your review, I'm more interested than ever in reading it. It's just fun, plain and simple. Glad you found it to be so as well! I still laugh when I think about it because a friend mailed to me with the ominous promise "I'm sending you a book that made me immediately think of you!" I laughed when I opened her package! Thanks for the great review. I'm going to see if I can put a copy on hold at the library. I agree with you on the disclaimer, so I might skim or skip some parts, but the idea of the story just sounds really clever and good. I enjoyed your review and now have this book on my ever-ever-ever-growing list. I was especially taken with your comment that you kept picking up the book...that's a sure sign of a good page-turner. I'd never read Jane Austen yet. Or, better, I'm the begining of Persuasion. But I believe I'll like and I'll want to read all of her books and related. So, this book sounds great.